Hyperlinks make it easy for your readers to navigate through the document. Only a single, compact file for you to distribute. Only one for your readers to keep around. HelpScribble's WinHelp files can be viewed on any Windows computer, without a web browser or other software. 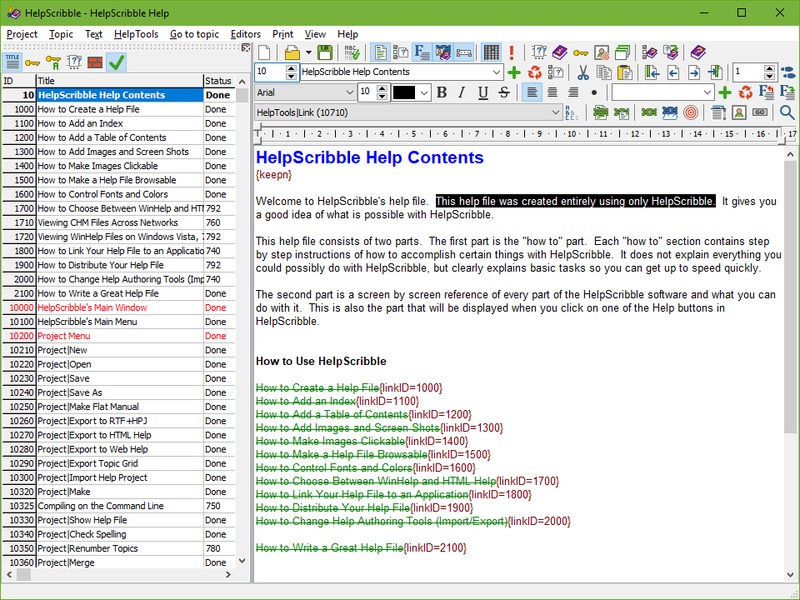 HelpScribble is easier to use than many word processors and HTML editors. Most documents are not read sequentially from the first sentence to the last one. People do not have time for that. They want to quickly zoom in on the information that they need, and skip the rest. If your document will be longer than, say, two pages, you will make things much easier for your readers if you split the document into many small sections. Reading text on a screen is more difficult than on paper. Long blocks of text are discouraging and will probably not get read at all. It is best to keep the length of every section below two screens. In HelpScribble, these sections are called "topics". You can create a new topic at the click of a button. Another click or two will create a link to another topic. These links work the same way like links on web sites do, except that the link points to another topic into the same file rather than to another file. Most of your readers will already be familiar with such links, and know how to use them to quickly find the information they need in your document. While you could use any HTML or web editor to create hyperlinked documents, they create a new file for every section of text and for every image. This results into a huge amount of files that cannot be distributed without the use of special archiving software, which your readers may or may not already have. HelpScribble compiles all the text and images into a single .hlp file. You can easily email this file, offer it for download on your web site, or put it on a floppy disk, Zip disk, or CD-R. The recipient of your document can easily copy this single file to a place where he or she will be able to find it again later. Because all the hyperlinks are internal, moving the file around will not result into any broken links. HelpScribble can also compress the .hlp file, if you want. A compressed help file is usually only about one third of the size of the same information in HTML pages. HelpScribble creates files in WinHelp format. WinHelp files are the .hlp files that are most often used to provide help with software, but are just as useful to create stand-alone, portable documents. These .hlp files can be read on any computer running Windows 3.1 or later. This is almost any computer purchased since 1992. No special software is needed. The WinHelp viewer is part of Windows itself. It is not possible to install Windows without WinHelp. Save your readers the trouble of downloading Acrobat Reader or other software by distributing your documents as WinHelp files. Many people do not use Microsoft Word, so you cannot assume that your readers will be able to open any Word document you may want to send them. Also, different versions of Word use different internal formats. The conversion of files created with different versions of Word is often troublesome. WinHelp is a very lightweight application. It will open any .hlp file instantly, even on an ancient computer from 1992. Do not make your readers wait. You do not have to be a computer expert to be able to make full use of HelpScribble. In fact, HelpScribble is easier to use than many HTML editors and other authoring software. In HelpScribble, you can create new sections by selecting Topic|New from the menu. Then you use HelpScribble's built-in word processor to type in the text. To create a link to another topic, simply right-click on that topic in the list at the left, and pick "Create Link" from the pop-up menu. That is all there is to creating a portable, hyperlinked document with HelpScribble.